Recently my family h ad the opportunity to review a product from HoMedics called Restore Clean Water System. 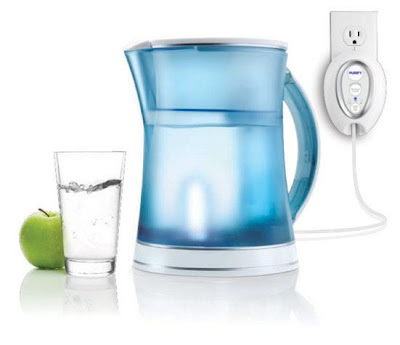 When I read about the new HoMedics Restore Clean Water System I really wanted to give it a try. I try to encourage my family to drink more water than they do! I am lucky that my oldest & youngest sons like it but my middle son is not waters biggest fan. When the Restore Clean Water System arrived and we used it I was amazed that everyone seemed to up there water intake. I am not sure if it was because it was on the counter as a reminder or if it was the fresh clean water....Hmmmm either way this mom was happy! Restore is a new state-of-the-art and innovative in home water purification system that combines filtration and UV Clean Technology. The difference with the HoMedics Restore Clean Water System and other water purifiers is that it does more than just filter the water. It actually purifiers. it claims to kill 99.9999% of Bacteria, 99.99% of viruses and 99.95% of Microbial Cysts from water using Germ Killing UV Clean Technology. The way this works is once you fill up your picture and replace lid, you simply flip a switch to purify . The UV light will come on once you tell it to purify and what is happening at that point is the UV light is removing bacteria, viruses and more. Restore Clean Water System is very easy to use. My 14 yr old & 10 yr old keeps and eye on it so they can be the one refill it when it is empty. It doesn't take long at all to fill up, plug it up and to purify it. The only thing that would make this system even better is if it was a little larger, as a family of 5 we can drink the 8 cups of water it holds in no time . Restore Clean Water System would me a perfect gift for the holidays, house warming gift or also great for a students dorm room. You can follow HoMedics Restore Clean Water System on Twitter and Facebook ! I've been thinking about getting one of these for my in-laws for Christmas. They have well-water...and it just grosses me out. I always take my own water over to their house, I wouldn't be so uptight about it if they had one of these purifiers though! This really intrigues me as I have a Brita Water Filter but I would love to have something like this where I'm not having to rely on filters.